This morning, I started on the bowing drills. Again. Something clicked and all of a sudden I was bowing like top notch fiddle player, the violin echoing in a machine gun barrage of unstoppable notes. I laughed. And then I put my violin away. The thing that got me thinking was, we could apply this same commitment to doing things mindfully with our horses. Horses are masters of movement pretty much from the time they are born. Sidepassing? No problem. Roll backs? Childs play! Capriole (a movement where the horse leaps into the air and kicks out with their hind legs)? Piece of cake. Flying lead changes? Easy peasy. It is only when we get involved with horses that things can get a little more difficult. Sidepasses, roll backs, flying lead changes – even just backing up – can all feel heavy and difficult and like a ton of effort. I have seen that when we are able to make a couple of small adjustments, things get easier. The first adjustment is breaking things down into smaller chunks (this is for both the human and the horse’s benefit). The second adjustment is creating a drill of sorts; something we can do with (and without) our horse over and over until both of our bodies sync up and the movement almost happens of it’s own accord. Then the drill disappears. This is the value of finding an instructor / horse trainer who can guide you through these drills and give you the feel of them. You get to choose how much to practice, how often to practice, and if that practice is of importance to you. This is why you will often hear Mark and I say that in order to get your horse going more softly, you need to find ways to go more softly yourself. Can you drive softly (i.e. breathing, letting go of the competitive mindset, letting go of your white knuckles on the steering wheel, etc), can you go through the activities of your day with your breath and awareness of each moment more intact? Can you groom and touch your horse with focus and the intent to be soft? More importantly, can you put that sneaky low down mean little voice in the backseat as you make mistakes, have difficult days, feel like this fumbling will never end? Beautiful! I look forward to following you! Thank you Kathleen – I appreciate that! That “sneaky low down mean little voice in the backseat” can ride along with us for years and years. But, as we become mindful of the depth of intuitiveness that our equine friends offer us, and we begin our journey of meeting them where they are at, we begin to notice that that little voice speaks softer and softer and a lot less frequently. You speak of horses being masters of movement until humans get involved….. That thought brought to mind how people think they are masters of knowing themselves until horses get involved. The practice of opening yourself up and slowing yourself down allows our best teachers, the horse, to show us how to live in the moment, be present and connect. That connection is very very difficult for many of us, but without it, a relationship with a horse is doubtful. So, the drill is practicing slowing down and learning how to be present. It takes time and practice, but is well worth the journey. I will share what my horse Whisper told me through a communicator, during our recent month long internship in Ocala: “Your mind should never move faster than my feet”. Quite profound……. Thanks for sharing your beautiful thoughts Crissy! You are so welcome, Nancy – thank you for sharing yours! Have you thought of writing a blog of your own? You write with such clarity and ease that it makes me want to read more of your musings. OMG Crissi, thank you so much. My immediate plan is to start teaching as soon as the snow leaves. The journey to bravery and self confidence is a very bumpy one. Some days the bumps are a lot smaller and you feel like you accomplish so much more. I have needed to do this for a very long time, and now is the time! Heart hugs! Thanks for sharing this. I really get what your saying. I think I’ve found such an instructor that is on your wave link. I just need to listen, be consistent and take it in. I love this post. I play the cello and often connect the idea of softness when I play cello with softness when I play with my horses. I find I get a better response from both if I remember to come from a place of softness. I need to remind myself to do this and to practice in all activities until it becomes second nature– as you wrote in your timely blog. Thank you for sharing your words. 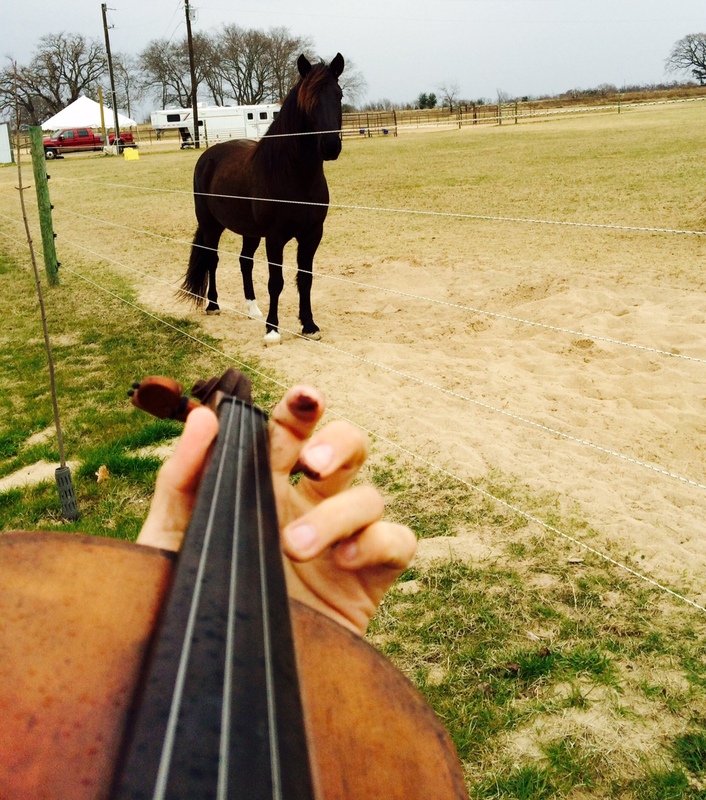 Thank you so much for sharing your own experiences with music, horse and softness. Love it all!